Paul came to Rockport, Maine in 1974 as a consulting soil scientist. He was introduced to duck hunting and became intrigued with the old duck decoys he saw. A friend in Rockland introduced him to Bill Faller, a well-known carver in the area. Paul says that Bill’s unrelenting critique of his work gave him a good foundation and taught him to be accurate with his subjects. Paul feels that while learning the mechanics and the techniques are important, the love of your subject and the desire to create it is key to being a successful carver. Over 30 years ago while visiting his parents in Florida, Paul’s Dad showed him a news story about a man carving decoys in pecky cypress. A trip to a local sawmill started a love of carving this wood that has become a hallmark of his art.The natural grain of this wood adds character and beauty to each piece. The nature of this wood means each one is truly one of a kind. After sanding, each piece is burnished, stained with oil and finished with wax. 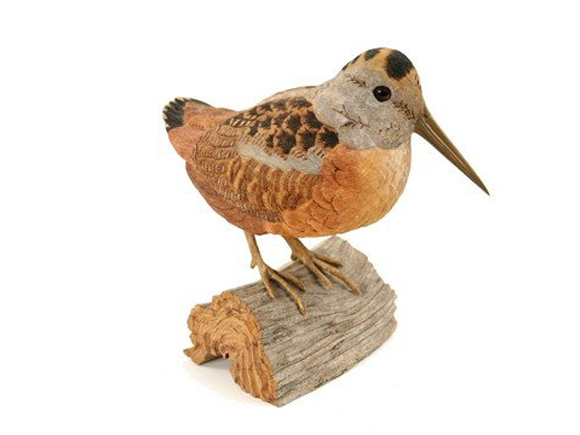 Paul has had the pleasure of taking classes with Dan Williams and Ernie Muehlmatt that has given him the opportunity to learn from World Class carvers and develop new carving and painting techniques. In creating his decorative pieces, he burns in the feather detail and adds realism with light washes to add color. Paul's work captures the essence and elegance of his subjects.